Back when Buicks were for dentists and their preppy kids, they commanded a presence like few cars did − handsome, solid, and torquey. Standard engine for their big cars was the “Nailhead” 401 in various states of tune, but for the entry-level LeSabre, it was 280 horsepower version with a regular-gas 265-horse version or the “Wildcat 445” with 325 horsepower as options. Like most cars of the time, a 3-speed manual was standard, but Buick’s Turbine Drive automatic or 4-speed manual were options. 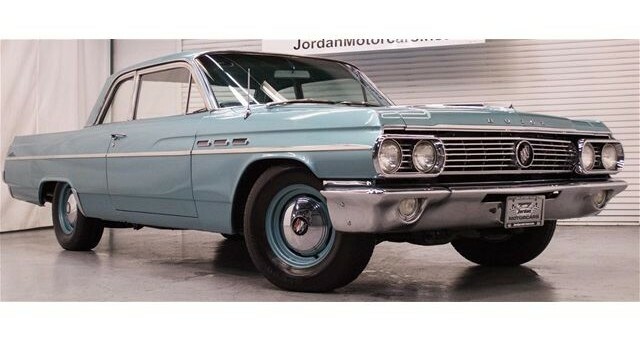 So perhaps one of the more frugal folks of distinction bought this cheapest of Buicks back in 1963, but someone in more recent memory added a 2×4 intake and carbs from a later Nailhead 425 to this eBay LeSabre, making it somewhat of a Q-ship of sorts − it’s probably a 350-horse sedan as it sits. Speed-shifting a 3-speed on the column must be a unique experience, but otherwise this is a pretty neat nostalgia piece with Offenhauser aluminum valve covers, heavy-duty suspension and brakes, and dual exhausts (reflecting the upgraded motor) being some of the more noteworthy features. Currently it’s at $15,300 without meeting reserve, but if you visit the dealer’s website, you can see they want $32,950 − certainly there are better values that can be found for old-car fun. Wow! The original “that’s not a Buick” Buick! It’s a coupe not a sedan. I’ve had 2 buick La Saber sedn.’s n both were 4spds. (1 factory n from a 3 on the tree dumped). These cars R getting harder to fine because of junk laws. I would “love” to get a nother one n put a “455′ in her w/dual quades (holly 750’s) w/electric pump n disk bracks + flow masters exhaust. come on lotto!! !